What Do We Know About Police Homicides? September 16, 2014 9:59 am / 2 Comments on What Do We Know About Police Homicides? “Barack Obama and Harry Reid and John Boehner: Pass a law mandating that law enforcement must file a report with the FBI every time a police shooting results in the death of a citizen.” I am asking for your help to get this petition off the ground. Do you know how many people are shot and killed by law enforcement every year? No? Well neither does anybody else. Records aren’t collected for what is called police homicides, which includes justifiable shootings. There are 17,000 law enforcement agencies in the United States, including local municipal police, but no national database to track police killings of civilians. The FBI maintains a partial data based of reports submit on a voluntary basis. Only 750 law enforcement agencies, just 44% of all agencies, volunteer to submit police shooting data. What the FBI collects and reports are only those cases in which police homicides were considered justified by the departments reporting them. There is no auditing or review process either. And some law enforcement agencies, such as the US Border Patrol, don’t even have to report people they shoot and kill to their command. When government law enforcement officers kill civilians it is our right to know about it. We are all ultimately responsible for the actions of our government. The first logical step is to require that a record be kept and available for public inspection. So, what does the current, ver very limited information on police homicides show right now? There are about 400 justified police homicides per year. Every week in this country there are two incidents like the one in Ferguson, Missouri, involving a white police officer shooting a black citizen. About half of all police homicides involve black citizens, and among the population of folks 21 years old or younger, the police homicide rate for blacks is 18%, twice the rate for white citizens (8.7%). Again, these numbers are based on voluntary self-report from less than half of all law enforcement agencies nation wide. It seems evident from what we know and don’t know that collecting better, more complete information about police homicides is important. There is no doubt that big donations are flooding into politics since the Citizen’s United decision by the Supreme Court. Another factor is the proliferation of highly political 501 C non-profit organizations. More than ever these organization take advantage of IRS policy to fund issue advertizing for their partisan candidates. All this money is narrowly concentrated. It comes from a few billionaires or from a relatively small number of special interest groups. Senators become obligated to their wealthy donors while the majority of citizens are not being well served. Much disaffection between citizens and their government has resulted from special interest politics, and this often suits corporate interests. The biggest price tags for US Senate seats this year are in Georgia and North Carolina. Spending between these races is expected to be nearly $50 million dollars, most of which will come from large donations. How on earth can average citizens compete with such big donors for the attention and fidelity of their Senate representatives? There is growing certainty that our Republic no longer represents the interests of most ordinary citizens.Here’s part of the problem. Big numbers are very hard to comprehend. Our brains aren’t wired to grasp numbers in the millions or billions. So if we want to understand how expensive our elections really are, we have to break down the cost into manageable units. Using Senate campaign cost estimates from the McClatchy news organization, and some census data, the following table breaks down Senate election costs by population segments. For example, the Michigan race is expected to cost $13.9 million this year, a lot of money, yet it breaks down to $1.85 for every adult living in the state. This is very close to the national average of $1.87 per adult for this Senate elections cycle. The really expensive Senate elections this year, on a per adult basis, are actually in Alaska and Arkansas where spending will be nearly $12 for every vote that is likely to be cast. Consider also that Senate elections take place every six years. That works out to just $2 per year per likely voter in the most expensive Senate seat, or about $1.10 for each Alaskan adult. *Estimates are from the McClatchy News Service as published in the New Jersey Star Ledger.Here then are some numbers that most people can comprehend. 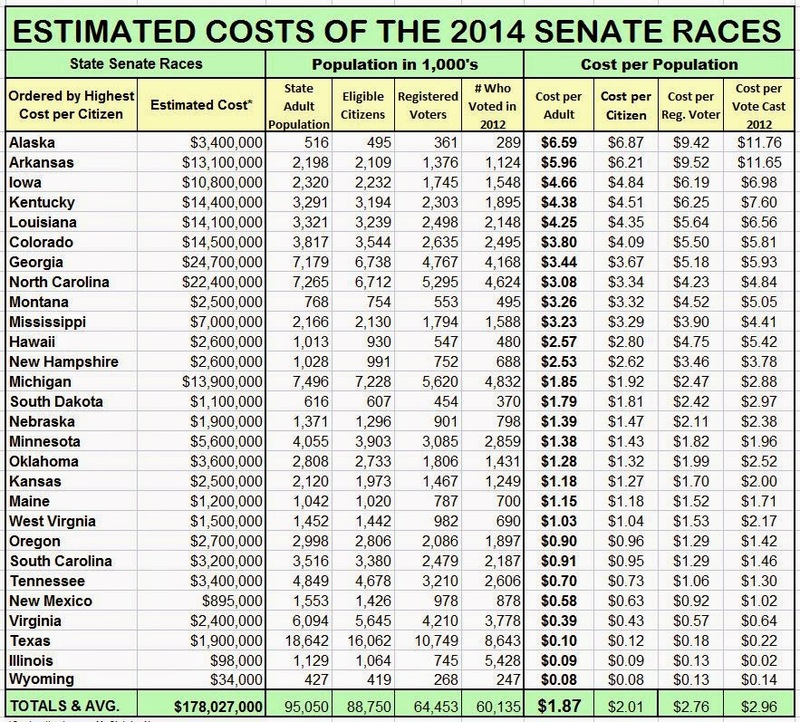 The average cost to an individual for this very expensive Senate election works out to just 31¢ per year per Senator. This is all it would cost you to buy back your vote.Elections cost money. To get the money interests out of politics people have to put money into it. We can’t let billionaires and special interest group buy the Congress at such bargain prices. It is time to step to the plate and publicly finance our Republic. Yes we need to undo Citizen’s United and make clear that corporations are not people. We need to do a lot of things, but nothing will restore our voice in government better than fronting the cost of election campaigns. When politicians need both our money and our vote we will have their full attention. Even a few dollars a month would go a long way to fund our democracy. It would do more to help the poor and support the middle class than almost anything else we could buy. We could even discount campaign finance contributions for everyone who registers to vote. As essential as voting is to fulfilling our civic duty, funding our Republic and being knowledgeable and engaged in public issues are just as critical. When Ben Franklin was asked what kind of government we have as he left the Constitutional Convention of 1787 he famously remarked, “A Republic, if you can keep it.” Now we know what he meant. It’s time to take back our Republic from special interest groups and quirky billionaires. This time let’s invest our time, talents and money to keep it in the hands of ordinary people where it belongs. After 2000 years of Christianity, the idea that the Bible is incapable of being wrong first developed among Protestants about 100 years ago. http://j.mp/1oCQrA0 But it is a mistake to view each and every detail of the Bible as inerrant. Anyone who holds this belief can’t possibly be correct since the Bible is so self-contradictory. It is a very humbling experience. 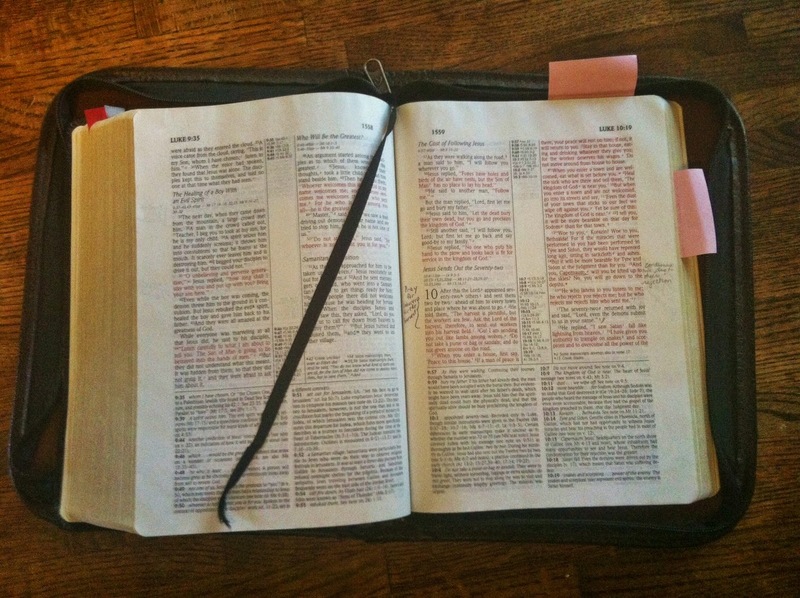 The Bible may be the inspired word of God, but it certainly was not written in a day. It was drafted over more than a thousand years. The New Testament was likewise drafted over the course of nearly 200 years, starting about 50 years after Jesus’ death. It was written by mostly anonymous authors in various locations, none of whom were eye witnesses to the events in Jesus’ life. If you wanted to read the New Testament in the order it was written, you would have to start with the letters of Paul, probably beginning with Thessalonians. The remarkable aspects of these earliest writings of Paul is that he never quotes Jesus nor provides any biographical information about him. This couldn’t have been because the words of Jesus were well documented, since these were literally the first documents written. The first Gospel of the New Testament was the book of Mark, written some 20 years after Paul’s letters. This was the first draft of the life, times and sayings of Jesus. Some scholars believe that Mark served as a template for the later works. Written 70 plus years after Jesus’ death, the author of this Gospel is unknown. It has the fewest biographical details about Jesus and the least amount of red ink (direct Jesus quotes). This account begins with John the Baptist at the start of Jesus’ ministry. It tells us that his family thought he was out of his mind while others thought he was possessed by the devil. It ends with his crucifixion, resurrection and being “taken up into heaven”. In addition to having fewer details than subsequent accounts, it also has certain details that are missing in later Gospels. For example, Mark very specifically states that the cross of Jesus was carried by another person. In the other Gospels, Jesus carried his own cross, falling down several times under the burden, etc. The point here being that details are fluid and sometimes contradictory, as would be expected given the generations over which the New Testaments were written. The Gospel of Matthew is believed to have been written sometime between 80 and 90 years after Jesus’ death. It was later named after Matthew, who was certainly not alive to write this text. And then, surprise, the Book of Revelation and the Gospel of John followed, probably in that order, but who knows exactly? The last of the four Gospel’s was the book of Luke. It may have been written as late as 120 years after Jesus died. The last book written in the New Testament is 2 Peter, believed to have been written between 150 and 200 CE. Of course there were very many other scriptures and texts written during the first and second century about Jesus and the early Christian church. The task of sorting all this out to come up with a single version of the New Testament began in earnest in the 4th Century, concluding around the middle of the 7th Century. However, even today there remains differences in what constitutes the Holy Bible. For example, the Old Testament Book of Wisdom is included in the Catholic bibles but not the Protestant bibles. Most Christian fundamentalists today rely on the Protestant version for their sources. They do not accept the Book of Wisdom, for example. Add to this the fact that every different translations leads to different interpretations. I believe it is fair to say the New Testament was written by many people over a number of generations and refined into the several versions we have today over the course of many centuries. It was not created in a day. It evolved, just as the Christian understanding of its means, and the Christian experience have evolved over time. The Catholic Church today certainly doesn’t act on many of the beliefs it held in the 13th or 14th Centuries. Over the millennium many different sects and permutations of Christianity formed and dissolved. Each group has pulled from different details, translations or interpretations to create unique constructs, and each in turn have been challenged or even attacked by other Christian groups doing the same. In this way, what it means to be Christian has evolved, and it will continue to do so in the future. There is plenty of room for doubt when interpreting bible passages. In fact, there is plenty of room to doubt the legitimacy of the whole Christian faith if you are inclined to do so. The existence of God, after all, cannot be proven or disproven. This is what distinguishes faith and knowledge. But the leap from faith to a fundamentalist dogma that the Bible is the inerrant word of God is another matter. Religious faith need not require the rejection of reason nor intellect. Belief in what is, or can be known, and faith in what we cannot know, are not mutually exclusive until we cross the line into religious fanaticism. Religious fanatics reject empirical facts that contradict any of their religious claims. The rejection of empirical reality is, in fact, what defines fanatic beliefs. In this regard all religious fanatics are alike. They require a fidelity to tenants of faith that directly contradict the natural world of the Creator God they worship. In the long arch of history, those who reject the evolution of Christian faith, those who try to deconstruct our present knowledge or force conformity to an unsustainable Christian understanding will ultimate fail. The only question is what damage will they do along the way. Who will suffer and for how long before the latest versions of religious fanaticism become extinct.